Ryan Kelley is here tonight with a guest review for the Bat fans out there - tell us all about it, Ryan! It seems like we haven’t gotten much from DCD in their 13” line lately. Perhaps they’ve neglected it to pursue other lines that are…er…less crappy. Let’s face it, high prices and lack of quality to match have hurt this line from the get-go, and it seems like things aren’t getting better. As much of a Bat-nut as I am, I found their recent Poison Ivy figure easy to pass up. Had the price on her been cut in half, I might have went for it, but there was just no justifying a $70-$80 price tag. If you want to see what I’m talking about, look up Michael’s review. In what seems like a very desperate effort to revive this line, DCD is giving us all-new versions of the two top dogs in the DC Universe: Batman and Superman. They also recently released a Golden Age Green Lantern that looks pretty cool, though I doubt it compares to their Green Lantern Corps figure. I believe this makes their SIXTH Batman (if you count Batman Beyond). This time we’re getting the Alex Ross versions, with Batman as depicted in the “Justice” storyline and the “Kingdom Come” version of the Man of Steel. These guys, as expected, aren’t cheap, with suggested retail at $100 apiece and actual retail at about $85, give or take. Obviously, I’ll be reviewing Bats tonight. I could go either way on the Superman, though it will probably take a pretty sweet deal on ebay for me to get him. These things are just too dang expensive. 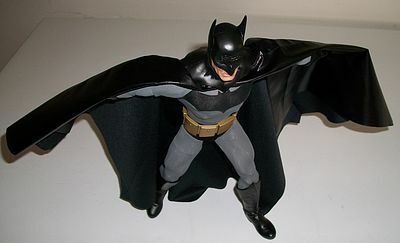 However, despite the overpriced-ness, I can hardly ever resist a good sixth scale Batman anymore, especially one that looks this freakin’ cool. This makes the third comic version of the Caped Crusader we’ve gotten in this line, and its two predecessors are two of the main highlights of the line thus far. Do we really need another? No, but we Bat-fans are crazies who cannot resist the impulse to fork over more cash every time we see our favorite hero in toy form. DCD apparently knows this and are taking advantage accordingly. But is it worth it this time? Let’s have a look…. Twisties. And more twisties. And yet more twisties. The box is well-decorated and in the same format as the others in this line, but I had to undo a whopping seven twisties on this figure, two of which went around a separate compartment containing the gripping hands. There’s also an eighth twisty around the display stand which I didn’t fool with. I fail to understand the reasoning behind all this. A-freakin’-mazing. Keep in mind that this is DCD we’re talking about. Unlike many of their early releases, the head is actually the right size for this large body, and everything else (arms, legs, hands, etc.) is also well-proportioned. The sculpting on the gloved hands and boots look awesome, appearing to be real leather material. 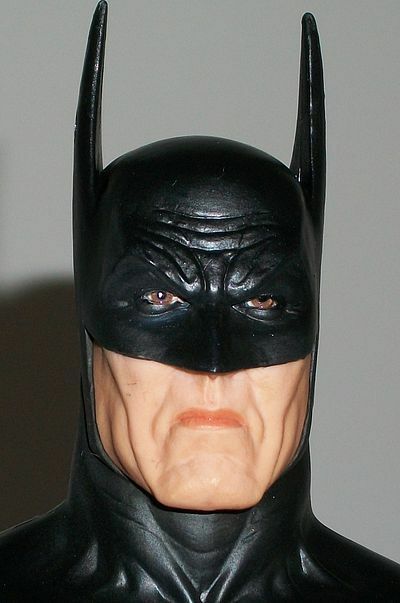 The sculpting on the face and cowl is stellar; not a single line, wrinkle, or chiseled feature is missing. I also love this expression. Batman’s face is loaded with intensity; he’s not here to play. He’s here to make some bad guys regret the day they were born. This is supposed to be a comic-based Batman, but he almost looks real. We know from the history of this line that DCD is better at comic-based sculpts than realistic ones, but here they do such an amazing job on a comic sculpt that it actually comes out looking realistic. This is beyond impressive. Sculpting alone never causes something to look real; it must be well-painted to take it the rest of the way. Here, the fantastic sculpting is supplemented by a fantastic paint job. There wasn’t a ton of paint necessary here, but the amount that was necessary has been executed with some real precision. 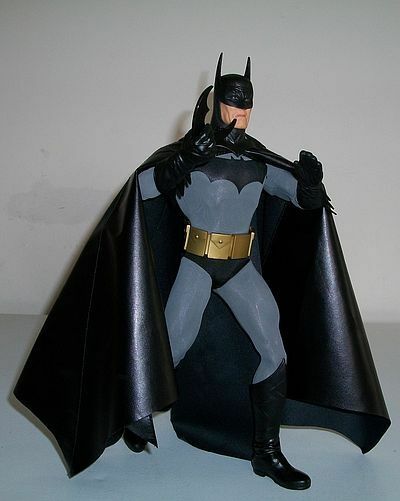 The cowl, gloved hands, and boots are all nicely done, and the face and mouth look great. The lips even look slightly moist. Then there’s the eyes. Never before in the history of this line have I seen eyes that look so real. The Ledger Joker’s eyes had been the best in this department thus far, and this one just about puts it away. These eyes, along with the rest of the face, really capture the darkness and intensity of Batman. Like the lips, they have a moist look to them that really adds to the overall realism of this figure. So, why the half-star deduction? The left eye appears to be slightly off center. Thus, if you look closely, you can see a bit of a lazy eye. It’s not off by much, though, and it’s a minor nit. Overall, the paint work is fantastic and really enhances the realism of the sculpt. One thing that DCD has been consistently good at for the most part with this line is the outfits. Every Batman they’ve given us so far has had a great outfit, and this one is no exception. In fact, this is by far my personal favorite. I love the black and gray look of Batman, and as much as I love DCD’s previous black and gray Bats, this one exceeds it. The cape, as you can see, is freakin huge, and is adjustable. Adjusting it does require a little work, since you have to tuck and untuck it from under the cowl to get it where you want it, and this causes some wrinkling on the upper part of the cape, but once you get it set up the way you want, it looks fantastic. 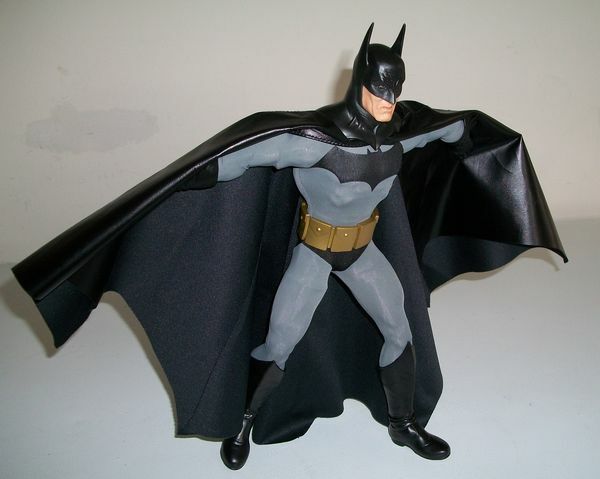 It’s made of a pleather material that has a great look and feel to it, and this time around it’s much thinner (and thus more poseable) than the leather cape on the older black and gray Bats. 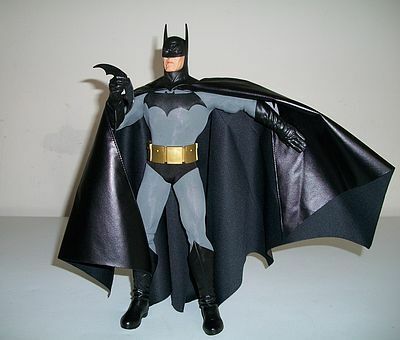 The rest of the outfit looks great, with the bat symbol well-placed and proportioned and the gloves and boots having a realistic appearance due to the awesome sculpting. The cape, however, is what really sets it apart. There’s almost nothing you can’t do with that cape because of its huge span and how well it looks and hangs. So, why did I knock off a half star? The belt. 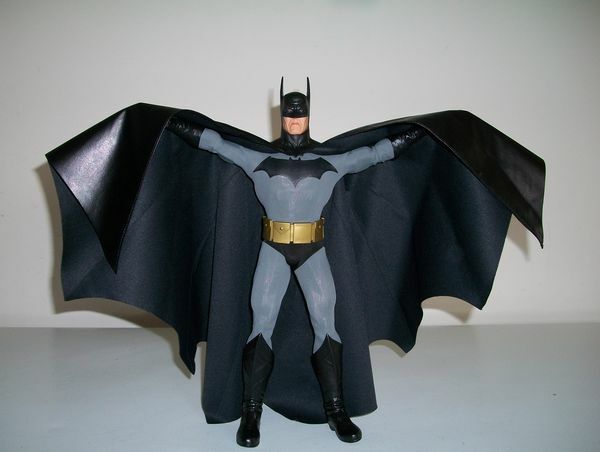 It’s made out of hard plastic, and looks about as real as one on a Batman that you’d spend $20 on at Toys R’ Us. It doesn’t take away much from the overall appearance of the figure, but it could be better. The other black/gray Batman has a great-looking utility belt, but this one doesn’t have the same level of quality as the rest of the outfit. Bats doesn’t quite do as well in this category, I’m afraid. DCD tells you on the box (and on the website) that the “body has been extensively modified.” That, I believe, is a lie. This appears to be the same superhero body we’ve gotten many times before, with the cut biceps and thighs showing through the fabric and limited mobility on the arms, which cannot come all the way down to the sides. Detail for detail, this looks like the same body. However, unlike most other figures in this line that can at least turn their head and look slightly up and down (and I mean “slightly”), Bats can’t look anywhere. The sculpted cowl extends down to the shoulders, preventing the head from moving at all. 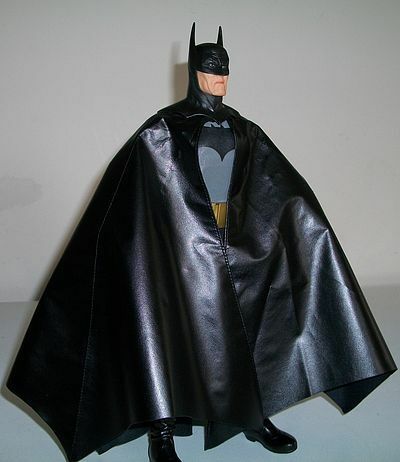 The head/cowl can turn about one or two centimeters to the left or right, which helps when adjusting the cape, but that’s it. This is one Batman that will have trouble backing out of the driveway. On the plus side, though, while it can sometimes be hard to get him to stand on his own at first, once you get him in a position where he will stand, an earthquake couldn’t knock him over. And, despite the restrictiveness of the sculpted boots, you can also get him in some good poses/stances. I was disappointed (but not surprised) when I saw the shortage of accessories on this figure. A guy like Batman loves his gadgets, and here he doesn’t get much. 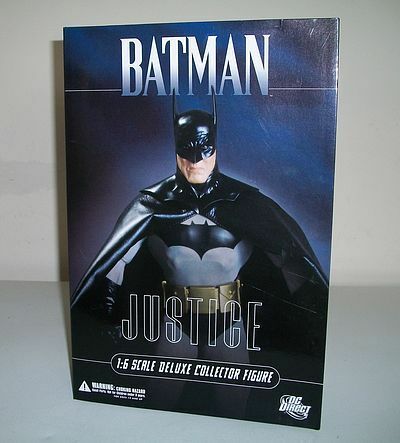 The previous Batman figures in this line had quite a few goodies, but DCD decided to screw us this time. I waffled between two and two and a half stars on this one, but finally opted for two and a half for one reason: the hands. Here we get three sets of hands: sculpted fists, sculpted open hands that are fully extended, and gripping hands, which come in their own separate compartment. This was a relief because since the sculpted hands are hidden in the packaging and not immediately visible, I thought I was only getting the open hands and fists, and thus nothing to hold the batarang with. Needless to say I was getting pissed at that point, but was relieved when I ran across the extra set. DCD deserves props here because they not only gave us three sets of hands, but NONE of them are bendable. That’s right, no bendies here. It’s probably too soon to say that DCD came to their senses and did away with the bendies for good, but it’s sure starting to look like it. The only problem with these hands is getting them on the pegs all the way, since the holes in them are slightly too small. I got tired of trying to force them, so I hollowed out the holes with a knife, and now they come on and off fairly easily. In addition, Bats gets a batarang. One freakin’ batarang. With previous Bat releases we got three, each with a different look and function. This time, only one. However, it is a nicely-done batarang. It has a slick and glossy look to it, and can fold inwards or outwards. DCD has been creative with the batarangs over the years, and while we only get one this time, I have to say that I like it the best out of all the others they made. So, if Bats only gets one batarang, at least it’s this one. And then of course, there’s the display stand. You won’t need it, but it’s better to have than not, I suppose. At around $85, you’re paying for more than what you’re getting. I found him at $62, which I would say is, surprisingly, an average value. Anything above $70 is pushing it, however, because as awesome as this figure is, the lack of accessories and apparent reuse of the same old 13” body offsets the more positive features like the sculpting, paint, and outfit. These “sixth scale” DCD figures are always overpriced, some more badly than others, but here, you can kind of see where the money went because, as we can see by the figure’s overall appearance and detail, DCD obviously put more effort than usual into this. Anything below $60 would be a steal, but if you pay $60-$70, you’re getting just about the right amount of quality for your cash. Even at $85, though, you probably won’t feel completely ripped off, just slightly ripped off. This would make a good toy, but the subpar articulation keeps it from being a great one. Also, I doubt that this is something you’d give to a kid unless you’re a millionaire. Take care when swapping the hands; they don’t go on easy. When you first try to remove the sculpted fists he comes wearing, it will probably be like opening a pickle jar. If you have trouble getting the other hands on, hollowing out the holes with a knife like I did should do the trick. Given the issues with articulation, reuse of the same body (and apparently lying about it), minor nits in the other categories—like the lazy eye and fake-looking belt—and the hefty price tag, I can’t give this figure an A grade despite the fact that it’s by far my favorite figure in the series. Keep in mind, this score is based on the $85 price that most places are charging right now. Since I paid about $25 less than that, my personal score would be three and a half. 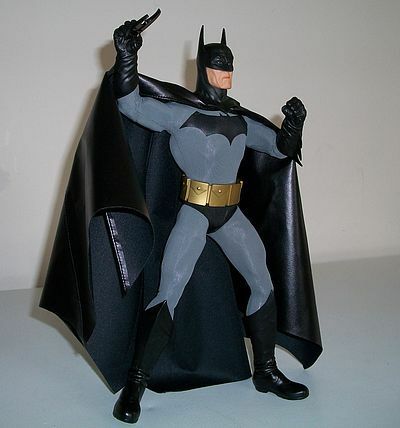 Despite the issues, the superb sculpt, paint, and outfit make this one of the best figures DCD has ever done in this line, and is certainly their best Batman to date. I’ve gotta say that DCD really wowed me on this one, and from pictures I’ve seen of the KC Supes, it looks like it’s on the same level of quality. They’ve shown us that they’re still capable of stellar work in this line on occasion, and I’m sure that many folks will look back on this Batman as one of its main highlights. This product was purchased for the review by the reviewer. Photos and text by Ryan Kelley.